I may have alluded to this before, but I've been appointed (self-appointed and by unanimous consent of all concerned) to be the custodian of the family history. All my life, photography and picture taking has been a big part. 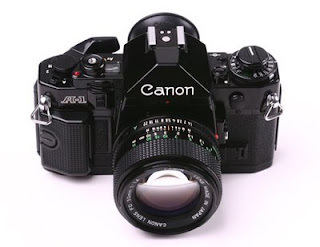 My Dad, an inveterate photographer, always had some kind of camera. 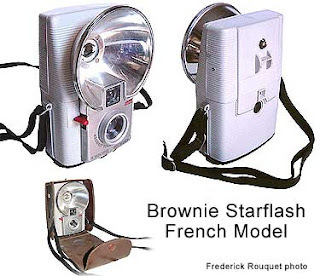 Since Dad was mostly broke, and unlike his son was credit-card-averse, his cameras for years consisted of the highly reliable, cheap, surprisingly good Kodak Brownie. He had 3: a black one, a blue one, and a green one. He took pictures of everything that came within his view; mostly his family, on which he doted. 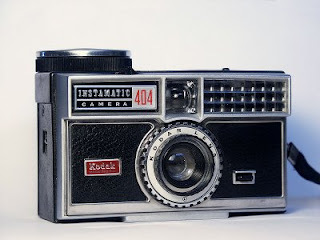 In 1966, he "upgraded" to an Instamatic 404, which he used until he got his first SLR, a Canon A-1. He kept taking pictures until his hands got too shaky to hold the camera still. I inherited the photography bug from him; was always fascinated; always begged him as a child to let me take a picture (he passed the old black Brownie on to me when he got the new blue one, though he wouldn't waste money on film for my photographic efforts at age 6...). Dad got the first Brownie because he and his wife had a new house, a new puppy, a new car, and a new baby on the way. He figured he'd better get a camera, and since paying for all that wasn't cheap, he opted for the Brownie. He took slides because (a) the film was cheaper to buy and cheaper to process, (b) storage was less difficult (he also bought an Argus slide projector, a total beast, exceedingly temperamental, and only Dad understood it. 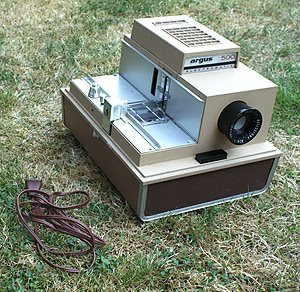 Also, it would allow only Dad to operate it; it knew how we felt about its temperamental ways...), which took these big metal "magazines"---also hideous to operate, and I'm dreading trying to extricate those fragile slides from those nasty old metal magazines), and (c) "slide shows" were a real event around our house. We'd get a new roll of film back from Kodak (because, of course, you had to send the roll of film off to Kodak for processing, they'd process, and send the box of slides back to you; took about a week or two, depending on how busy they were), Dad would load them into a magazine, we'd stretch a sheet across a window (or just take one of the pictures off the wall) and have a slide show; Mother would pop popcorn, we'd all get a Coke or Dr Pepper, and on with the show. When we broke up Mother and Dad's household, along with boxes and boxes of family history/genealogical research, I inherited boxes and boxes of slides. The slides are all of my baby pictures, my sisters, my first trike, my first bike, all our dogs, Christmases 1957 through around 1980, all the loved relatives now gone, Dad's trip to the Holy Land, my "Grand Tour" of Europe (he let me take the 404! ), my first car, my sister as a pep squadder, my sister as a baby wanting to ride a horse (how unusual... ;-). I smile and wink because she lives on acreage in Boerne, TX and has horses---which are pets, very large pets who eat a lot and make very large poops and occasionally consent for her to ride on them. In any event, the old 50's slides are very, very fragile now. They are in complete disarray and disorganization. The good news is, Kodak always printed the date on the slide, so I know when they were taken; of course, I remember most of them so the "where" part isn't difficult. My year-long project is going to be to scan and catalog those slides. I would be SHOCKED (shocked!) if some of them didn't find their way here. So, it's off I go a-scannin. I figure, it's something to do this winter when the days are long and somewhat rainy. 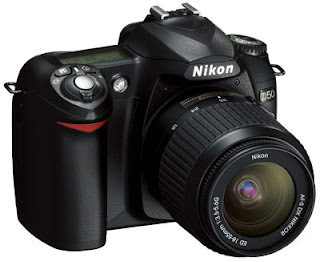 One more thing: I've got a Nikon D50 (very nice) with a cheap but effective Promaster zoom lens (I want the Nikon Zoom-Nikkor Zoom lens - 18 mm - 200 mm - F/3.5-5.6 - Nikon F; as soon as any of you would like to contribute $800 or so to my cause, I'll have one...), and I like to flatter myself that I take some pretty good pictures. But you know, I'll bet Dad's were just as good or better, with vastly inferior equipment. Stay tuned. Can't wait to see some of your dad's photography. Happy scanning.